AE Interests: The Villa Mairea, built as a country house for Harry and Maire Gullichsen by Alvar Aalto in 1939, is a significant dwelling that marks Aalto’s transition from traditional to modern architecture. It is composed of a mix of materials that “morph” and change throughout the structure. Aalto wanted to blend the interior and the exterior, he used a lot of differently sized columns that mimic the birch tree forest around the house, “to avoid the artificial architectural patterns in architecture.” The house is slightly L-shaped, which makes a public and private side for the residents. The final design is heavily inspired by Frank Lloyd Wright’s Fallingwater. AE Interests: This remodeling was part of a larger exhibition called Casacor/Rio Grande So Sul, an exhibition of architecture, interior design, and landscaping. The kitchen has a warehouse character and reuses a lot of the materials to be sustainable. The iron rebar mesh wall is reused from the construction phase of the project. The vertical garden wall is made with bags of recycled fabric from PET bottles. Another sustainable element is a kitchen garden that provides raw material for the preparation of the chef’s dishes. AE Interests: This is a major renovation of an existing factory into a community center, with an addition of 2 vertical buildings attached by walkways. 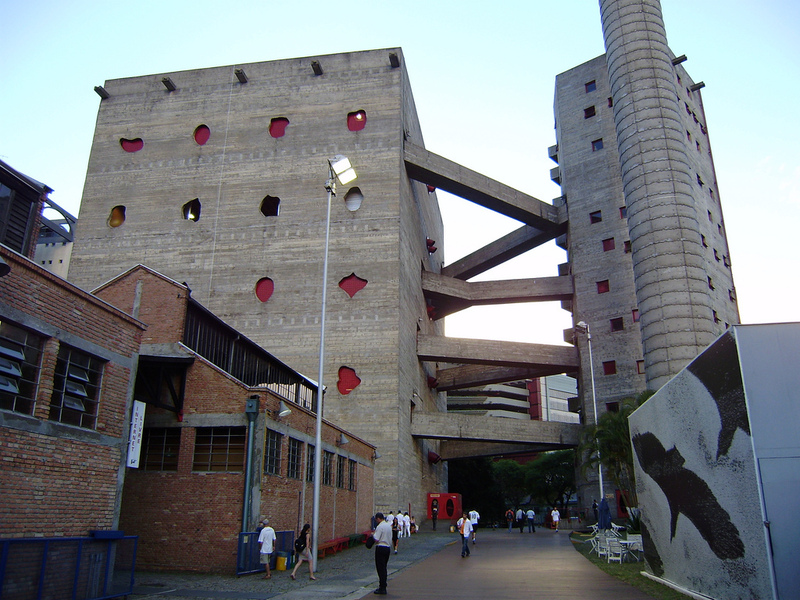 A “Sesc” is a facility for leisure, education, sports, and cultural activities. A major element on the outside of the buildings are the red screened irregular windows, which the architect relates to “Spanish civil war hole.” The water tower is cast in place concrete using an “oozing joint” technique that you can see in the finished façade. The original drum factory was one of the first examples of reinforced concrete being used. There are eight pre-stressed concrete walkways that span gaps up to 25 meters. Bardi also wanted an inviting “street face” to draw the public in to use the space.